My sister thinks she’s soooo smart. On October 27, 2011, after 6 years of faithful service, my sister finally graciously crowned me Employee of the Month (at Cook Dollar Barn) October of last year. On the 27th. Doing math, my reign was FOUR DAYS. Yes, I am usually the only employee. Yes, she has bestowed this honor on many non-employees and the dog (Walli Pajari-Williams). But it wasn’t quite enough to win me the title. 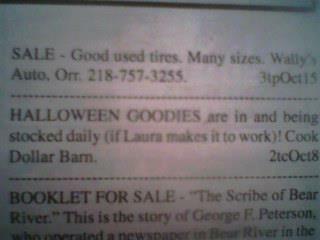 That’s Cook Dollar Barn, PO Box 1047, Cook, MN 55723. Now that the summer rush is over, I have taken up the torch again. Only now I want to be Employee of the Year. Less pressure on a monthly basis. I have set the poll to allow multiple votes per person. Because this is not a real election. So vote as often as you like, unless you’re voting for the dog. If you don’t feel you have enough information to cast your vote, that’s ok. More posts to follow. From the Past Employee of the Year…GO FOR IT!